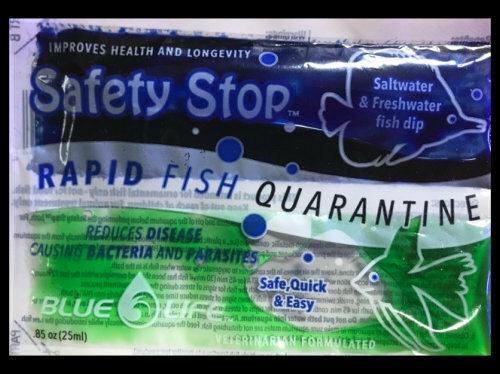 Safety Stop is a simple and effective way to help protect your saltwater and freshwater aquarium fish from serious unwanted disease outbreaks caused by external Parasites and bacterial infections. New fish are often the source of infectious diseases that can wipe out an entire aquarium. Be proactive and give your fish a SAFETY STOP bath to significantly lower the risk of introducing deadly diseases. Instant quarantine for freshwater or saltwater fish. Freshwater or saltwater fish dip to reduce disease causing bacteria and parasites. Get yourself into the habit of purchasing a package of SAFETY STOP with every fish purchase!! !